Sunday only Clay Hall (CL) allocation withdrawn in favour of increase at Leyton (T). Sunday only CL allocation re-introduced. Sunday withdrawn between London Bridge and Elephant & Castle. Clay Hall (CL) allocation suspended for winter months. Sunday only Clay Hall re-introduced for summer months. Sunday only Clay Hall (CL) allocation withdrawn. RTL type replace RT at Victoria (GM). RM1088 is seen at High Street Stratford heading for " Blue Boar "
Sunday withdrawn between Woodford Bridge and Abridge. 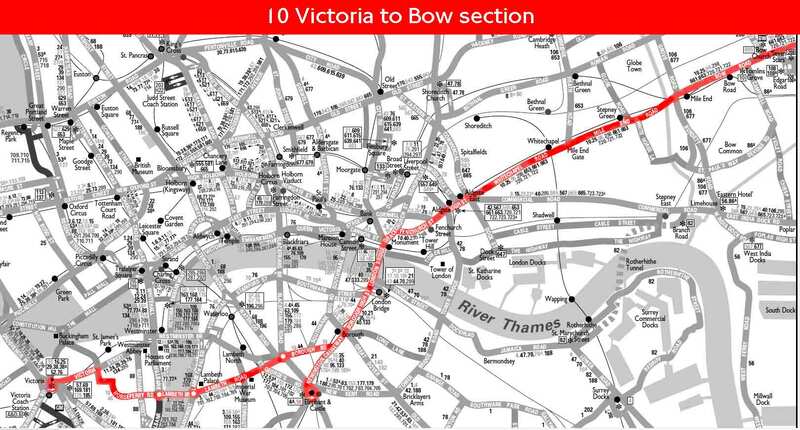 and further withdrawn Saturday evenings between Bow and London Bridge. Sunday evenings withdrawn between Wanstead and Woodford Bridge. Withdrawn between Woodford Bridge and Abridge and between London Bridge and Aldgate - this section replaced by new OPO Route 10A. Mon-Sat rerouted at Wanstead to Woodford Wells and extended from London Bridge to Victoria. Withdrawn between Wanstead and Woodford Wells and Saturday evenings withdrawn between London Bridge and Victoria. Extended from London Bridge to Victoria at all times. Sunday am withdrawn between London Bridge and Victoria.